The American Cancer Society is determined to ultimately eliminate cancer as a major health threat. While striving to reach this goal, the American Cancer Society works daily to save more lives until a cure is found. The real strength of the American Cancer Society lies in its volunteers, who translate policy into reality. Motivated by personal experiences and concern for others, they accomplish the mission of the American Cancer Society. You can join us in accomplishing this mission by participating in the American Cancer Society Relay For Life, a team event to fight cancer. Relay For Life is a family-oriented event where participants enjoy the camaraderie of a team and also raise funds to support the activities of the American Cancer Society. Participants camp out at the Relay site, and when they are not taking their turn walking, they take part in fun activities and enjoy local entertainment. Teams from companies, churches, organizations, hospitals, and schools collect donations and can win individual and team prizes for their efforts. These events represent the hope that those lost to cancer will never be forgotten, that those who face cancer will be supported, and that one day, cancer will be eliminated. 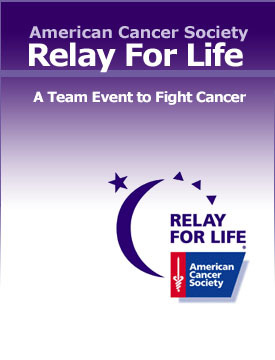 This year the American Cancer Society is proud to host 8 Relay For Life events in Brevard County. Locations include: Merritt Island, Titusville, FL Tech, Melbourne, Palm Bay, Rockledge, Cocoa Beach, and Cocoa. “Relay For Life brings the progress against cancer to the forefront,” said Angela Bundesen, event chair. “Many participants are our family, friends, and neighbors who have dealt with cancer themselves. Their involvement is proof of the progress that has been not only reducing death rates, but also in the quality of life following cancer treatment. In Brevard County alone, the community showed an incredible amount of support. • Provided free assistance to over 1,186 new cancer patients & their families. • Hosted 7 Relay For Life events. • Raised over $440,000 through the Relay For Life. • Raised over $528,000 through all fundraisers in Brevard County. • Lighted over 1627 Luminaria candles in memory of those we have lost to cancer and in honor of those who have survived. • Gathered 225 teams from local businesses, churches, organizations, families & friends together in the fight against cancer. • United over 3,000 community volunteers through Relay For Life.